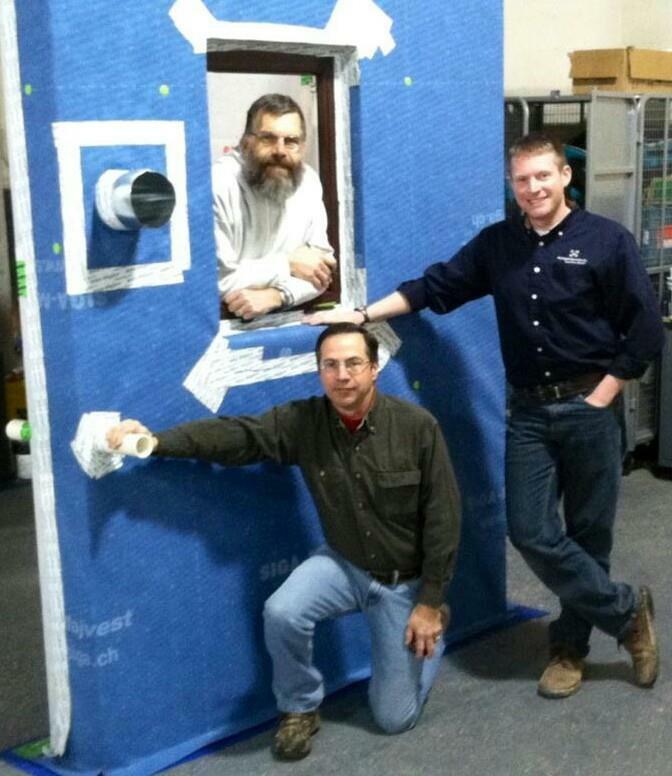 Wheatland Passive House is well on its way both under construction and though the certification process. We are in line to meet all of the PHI requirements. I figured it was a good time to go into some details on our 4th go around at double wall construction, and what we have learned in the process. I have dealt with double wall construction on previous projects, but I it was well before my Passive House training. While I was with Airtight Services we did a wide range of consulting and along with insulation services, but cellulose is the specialty. They can dry blow, dense pack, and damp spray cellulose. The preferred method for us insulating the double wall system is to install a fabric on the back side of the interior wall and insulate the outer wall and empty cavity with dry blown dense packed cellulose. Samples can be cored and weighed to ensure correct density. Once all of the rough in mechanicals are in, the remaining interior wall can be damp sprayed (and any interior walls can be damp sprayed for sounds deadening) to complete the insulation package. This is ideal because it maintains a protected air barrier with few penetrations allowing drying potential in either direction depending on interior and exterior finishes. This project didn’t start off as planned. As you can see, there are a few problems right off the bat.1) No fabric was installed between the walls for us to dry blow the cellulose. The wall is too thick to install damp spray cellulose in the entire wall — It would NEVER dry.2) There was also quite a few area’s where plumbing was running between walls. So we’d have to work the fabric around the obstacles. 3) The studs were lined up, so you couldn’t physically get a stapler between them to staple up a netting after the fact. We were forced to work the netting in between the walls in small sections. There were some area’s (above and below windows) that were too small to work in, so we had to face staple the netting. It worked out okay because of the fact we were actually pushing the netting against the framing, so we didn’t need to bunch of staples — except on the ends. After learning some great new techniques, some material science, and terms like “Floppy Bit” we were ready to try the double wall again.